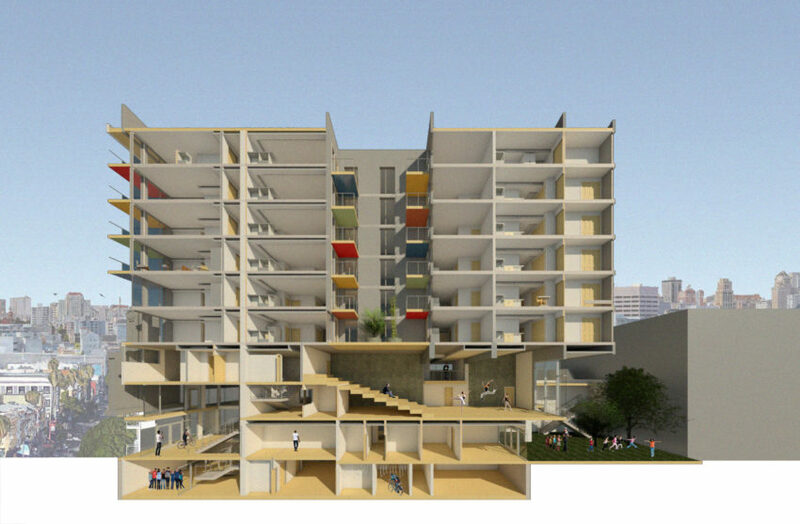 Concept of MEDA’s 8-story building on the corner of 18th and Mission streets. Image courtesy of MEDA. The Mission Economic Development Agency is proposing an eight-and-half-story mixed-use building at the corner of 18th and Mission streets — now the site of a decaying former stove store that could cost the nonprofit as much as $1 million to restore. 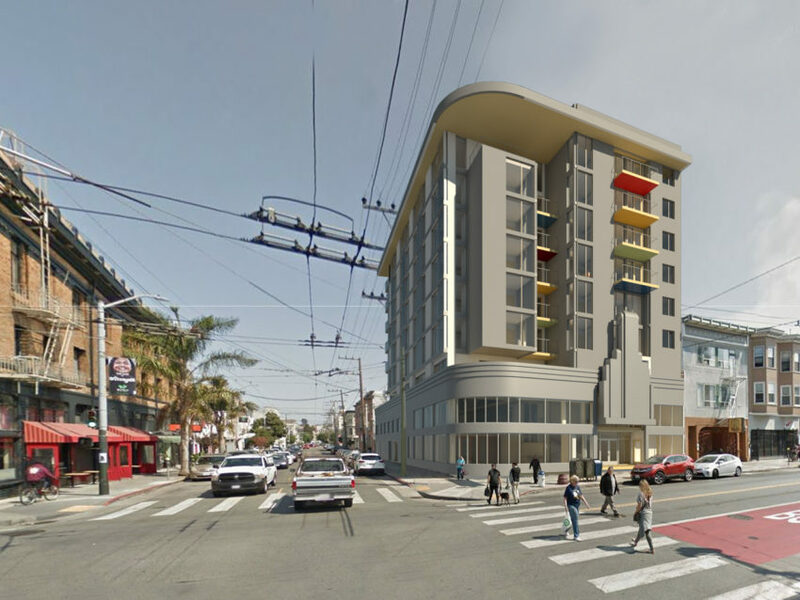 As Mission Local reported in December, MEDA bought the building for $6 million, with plans to develop it mixed-use project that will house two non-profits and includes at least 40 affordable condominiums. The project is expected to cost MEDA $45 million. Per the plans, Mission Neighborhood Center will occupy the ground floor with classrooms for about 100 children, Lisa Gelfand of Gelfand Partners Architects said last week at a meeting for the project. Outdoor space will be included for the childhood education center. Dance Mission Theater will take the second floor with dance studios. The remaining six floors are slated to become housing. While the unit mix is still being determined, each floor will have four 1-bedroom units, three 2-bedroom units, and one 3-bedroom unit. The project will have, at most, 48 units for purchase. Vera said MEDA is working with the Mayor’s Office of Housing to keep the condos affordable “in perpetuity,” so that owners can gain equity on their home, while still keeping the units affordable when it comes time to sell. Vera said this might be done through a cap to limit appreciation on the home, although the non-profit is still looking into the model. “There’s still a lot of thinking around how we’re going to solve that problem,” he said. As it stands, the project will not have parking, since the building is in a transit-rich area with service from multiple bus lines and the 16th and Mission BART station. The basement will include bike storage. Vera recognized the lack of parking might be a point of consternation when the project seeks approval from the Planning Commission for the dance studio sometime in 2019. “That has been a concern that others have raised about projects such as this in the past,” he said. The nonprofit expects to win its entitlements and break ground by winter 2020, and anticipates the project to be complete by winter 2022. The cost of the project has been “fluctuating” around $45 million, Vera said. To finance its commercial spaces, MEDA is seeking federal tax credits, and it will be taking out various loans to finance its residential component. “The biggest challenge is keeping our construction costs low,” he said. That might be hard, as restoring the original structure — a “Streamline Moderne-style building that housed Gernhardt-Strohmaier Stove Store from the mid-’30s to 1961″ — could cost as much as $1 million, depending on a determination by the Planning Department, Vera said. MEDA will likely have to preserve the clock tower on the building. Elizabeth Creely, who researched the history of the building extensively for Mission Local, said the clock tower is the last remaining vestige of the building’s 1930s Streamline Moderne redesign. Other distinguishing characteristics from that era — such as a porcelain facade — were destroyed in 2013 by then-owner Guadalupe Hernandez. In addition to this project, MEDA is also developing fully affordable projects at 2060 Folsom, 1990 Folsom, 1296 Shotwell and 681 Florida, representing around 479 units. Disclosure: Mission Local rents office space from MEDA. San Francisco Public Library, 1938. So MEDA is going to spend $1 million per unit of our affordable housing money. Can they seriously not do this for any cheaper? Sounds good, and I wish this organization would stop blocking the other housing projects in the neighborhood. In my growing up years the 60’s and 70’s that place was Four Brothers furniture store. A place with “Liberace” style furniture.